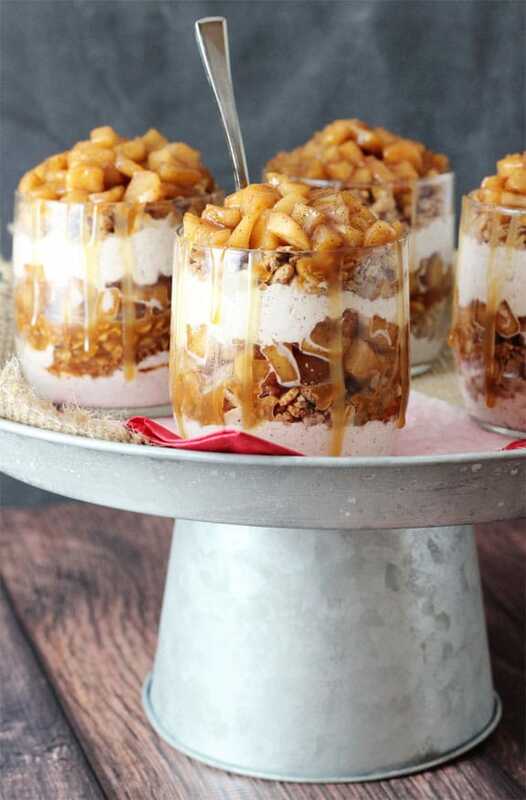 These Caramel Apple Trifles are the perfect apple treat – no bake, super easy and full of cinnamon! 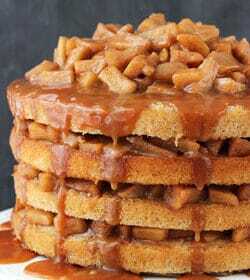 It’s also my last recipe for Apple Week. 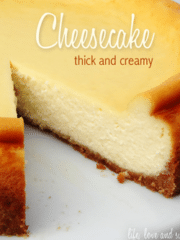 It’s sad to see it go, but be sure to check out my blondie cheesecake and layered cake. So many tasty apple choices! 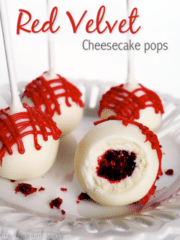 Julianne, from Beyond Frosting, has been cranking out some awesome apple recipes too, so be sure to check out her cheesecake bars, muffins and ice cream. So the craziest thing happened the other night. I was sleeping peacefully when all of a sudden the tv in our bedroom came on. Immediately I turned to accuse the hubs of waking me up. I was ready to banish him to the living room to go watch that tv. I had my death stare ready to go but when I looked over at him, he was passed out cold. Not even moving. I called his name and woke him up and asked him if he’d turned on the tv. Perhaps he’d turned it on and was pretending to be asleep? Maybe it was a bad joke? Nope, it wasn’t him. And when I located the remote, it clearly wasn’t within his reach. So the tv had just turned on all by itself. We had two dogs in the room with us (dog sitting my brother’s dog) and neither of them budged, so it didn’t seem like anyone was in the house. The whipped cream is homemade and super easy. I could eat it on its own with a spoon. And I made my own caramel, but it’d be easy to replace with a store-bought one, if you prefer. It’d make these even easier to make, which I’m totally down with. The cinnamon apples are baked right on the stove. They probably are the most time intensive part of this, simply with all the chopping. Totally worth it. 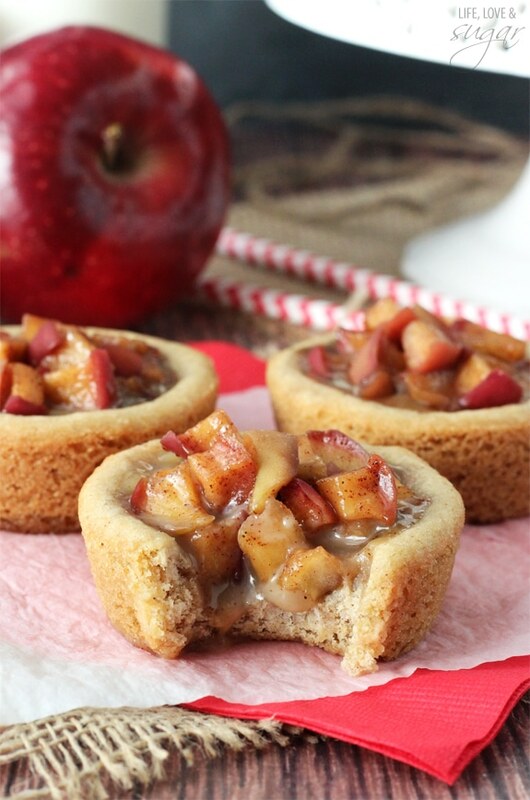 These would be great for Thanksgiving! 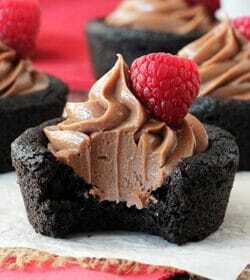 With all the cooking on, these are an easy but pretty dessert that can be made ahead of time. 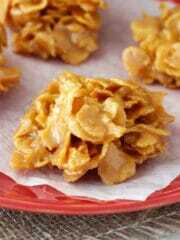 I’d actually recommend making them at least a few hours ahead, giving the granola a little time to soften up. 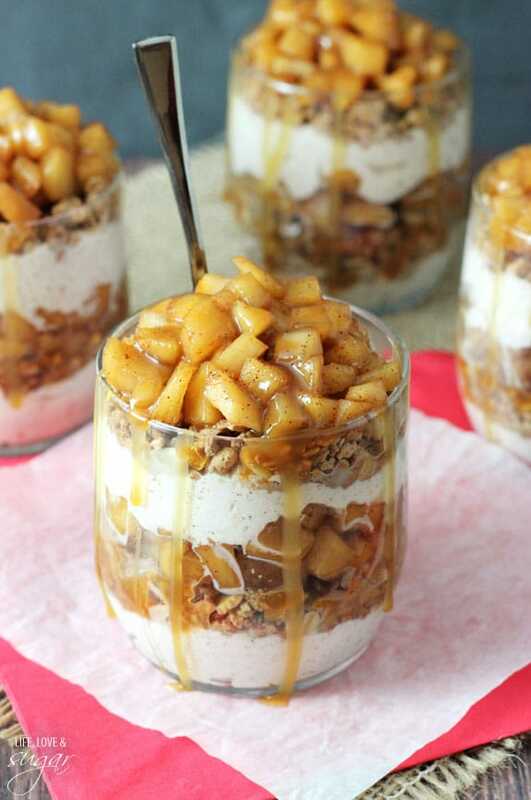 I love the combined texture of the slightly crunchy granola, apples and creamy whipped cream. Perfect! 1. To make the caramel, add the sugar in an even layer to the bottom of a medium saucepan. 2. Heat sugar on medium-high and whisk until the sugar has melted, about 5 minutes. The sugar will lump together, but eventually melt. 3. Continue whisking until the temperature reaches 350 degrees or the sugar has turned an amber color. It will reach 350 degrees very quickly after all the sugar has melted. Watch it very closely. It goes from nice caramel to burned very quickly. 4. Remove caramel from heat and add butter. Whisk until melted and combined. Mixture might bubble a bit. 5. Add the heavy cream and whisk until incorporated. 6. Cool caramel to room temperature. 7. To make the apples, combine apples, lemon juice, nutmeg, cinnamon and brown sugar in a medium pan and toss to coat. 8. Add butter and cook apples for about 15-20 minutes, or until at preferred softness. 9. Allow to cool for 15-20 minutes. 10. To make cinnamon whipped cream, freeze a metal bowl and whisk attachment for 10-15 minutes. 11. Remove bowl from freezer, add heavy whipping cream, and whip on high speed until it begins to thicken. 12. 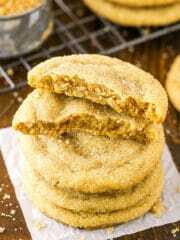 Add powdered sugar and cinnamon and whip until it you get stiff peaks. 13. 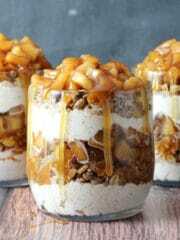 Once everything is made a ready, build the trifles. 14. Pipe an even layer of whipped cream into the bottom of the cup or jar you are using. 15. Add about 2 tbsp granola in an even layer. 16. 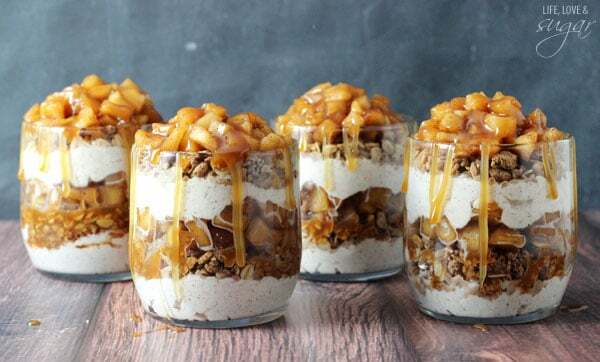 Drizzle caramel over granola. 17. 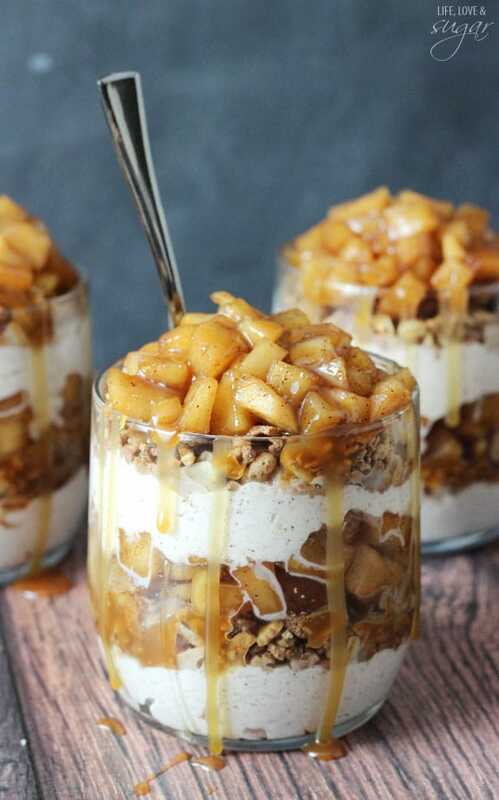 Spoon apples over caramel. 18. 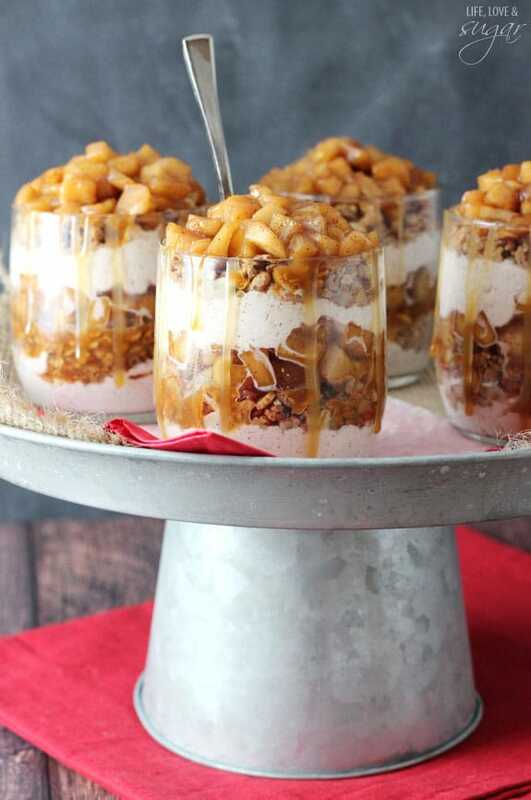 Repeat layers 14-17, then drizzle more caramel over the tops of each trifle. 19. Store in the fridge for 2-3 hours, or until ready to serve. 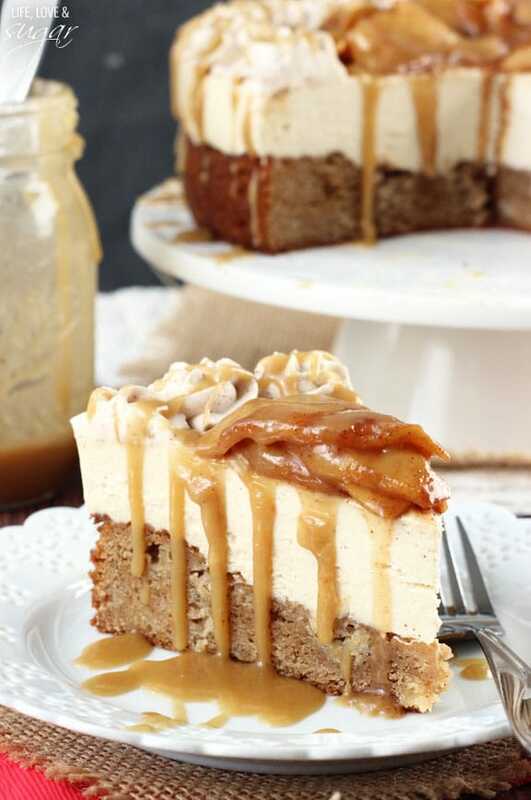 *You can replace the caramel sauce with a store-bought sauce, if preferred. I’ve really enjoyed the theme week, Lindsay! And you’re finishing off with such a great idea! I’m going to try this at my next fall party! Thanks Mir! Glad you liked all the apple! Girl, you ended apple week with a BANG! Yumm!!! These are gorgeous! 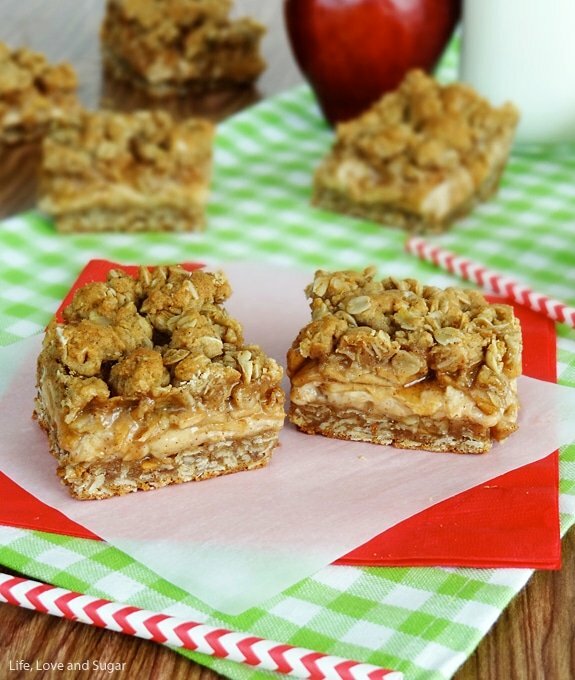 I’m on such a caramel apple kick right now and I’ve loved your recipes this week! 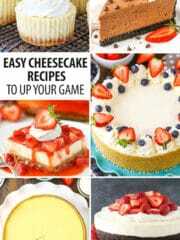 these look SOOOOOOOO delicious. I’m drooling! That’s so creepy about your Casper episode! I’d be up for the rest of the night, absolutely terrified that someone broke in to the house. Especially because our dog isn’t exactly the greatest watch dog… She doesn’t even bark if we aren’t home! So strange. 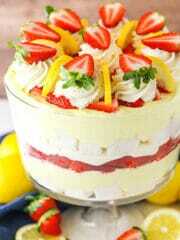 But anyway, I’m loving your trifles! I grew up eating an apple every day in my lunch, so they’re one of my favorite fruits. And all that drippy caramel? Pure heaven! 🙂 Already pinned! Thanks for the pin Amy! If I hadn’t been so tired, I might’ve been up worrying. 🙂 Our dog is usually on top of it, so it was kind of weird. This is one of the best things I’ve seen all week! 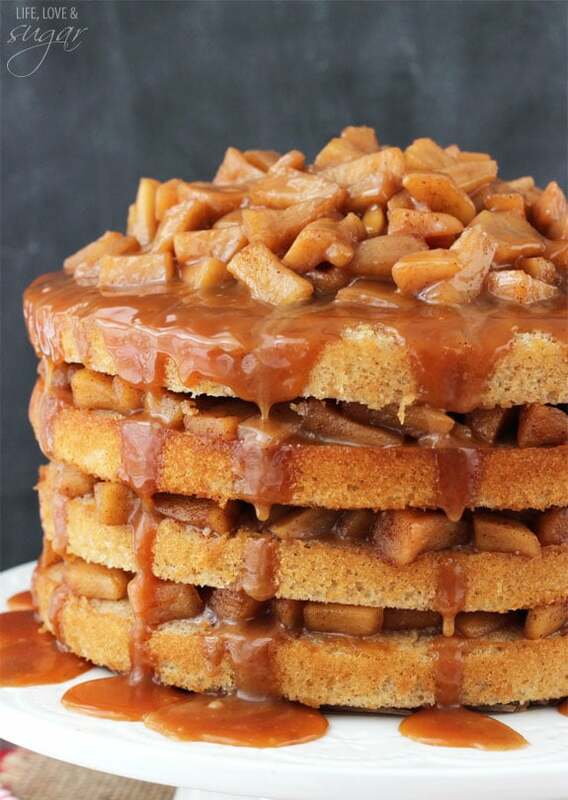 Your delicious recipe has been nominated as one of the “Top 100 Best Apple Recipes of 2014 for National Apple Month”. 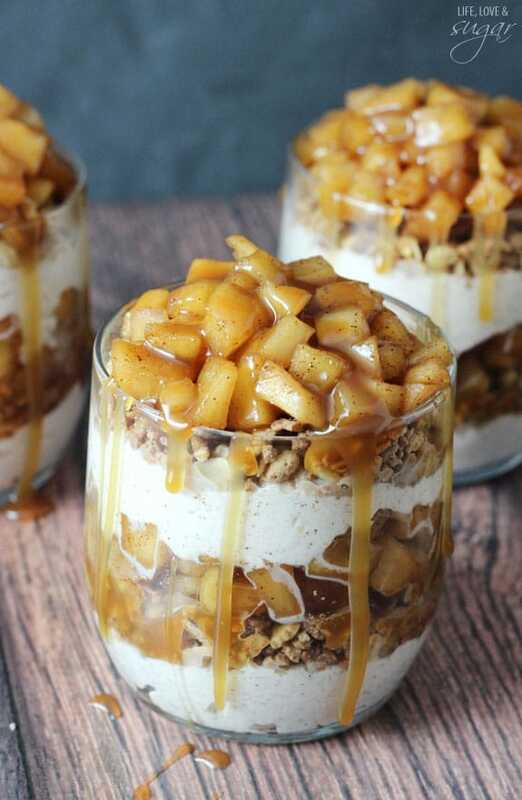 You and your readers can vote for it here: http://thefoodexplorer.com/fruit-2/100-delicious-apple-recipes-for-national-apple-month/ (position #20 – random order). 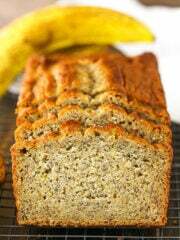 I made this amazing recipe twice this weekend for a wedding shower. (I tripled the recipe and put it in a big trifle dish. 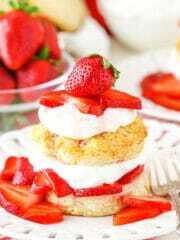 )– See, I got the day mixed up and went to the event, trifle in hand, on Saturday only to find out the shower was SUNDAY. We happily went home to Netflix and ate the trifle ourselves! Most of it anyway. I got up next day, bought more cream, and remade the trifle for the shower, where it was a big hit! Yum, yum, yum. 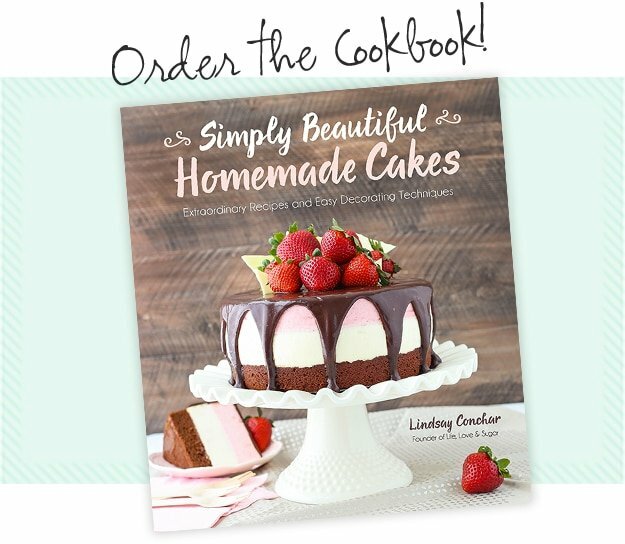 I want to try the 4-layer cake next, looks amazing. Thanks for the trests! 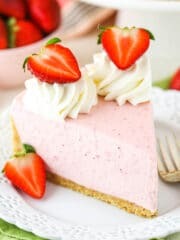 Do you think I could do this as one BIG trifle? Thoghts…changes…suggestions? Yes I think so. There was another comment from someone who said they’d done it. I’m sure sure what to adjust though. I imagine you’d need to at least triple the recipe for a large trifle dish. I believe it was Red Delicious. I’m making your delicious sounding trifle recipe for a Christmas party on Wednesday and was wondering how many oz are your servings? It says 4 but how big is each? I need to calculate the quantities for 12 x 3oz mason jars. Thanks! I believe these are 9 ounce cups. Hi! 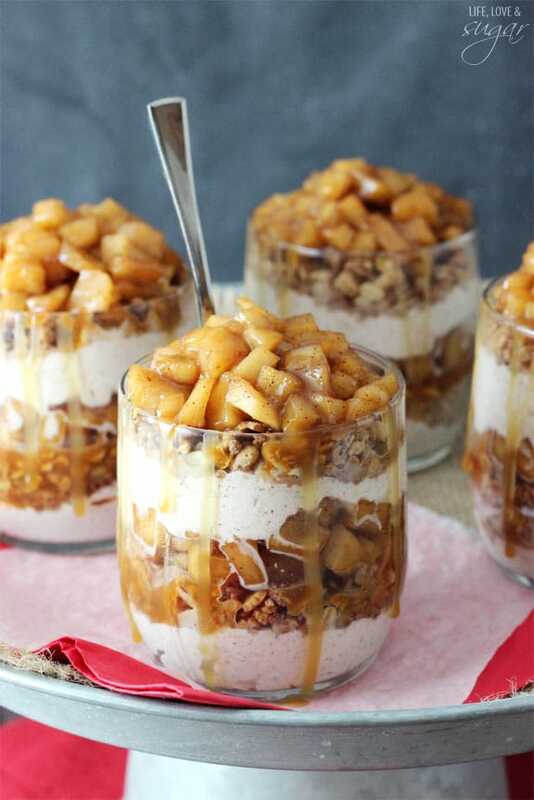 If I were to make this in a regular trifle bowl (instead of minis), would you recommend doubling the recipe? Thanks! Yes, I would recommend doubling the recipe.